He’s leaning against a brown Volkswagen Bus with patchy chunks of rust and an orange stripe around the top. His cigarette isn’t really being smoked, just held between his fingers as he looks up and down a small main street with buildings on only one side, the west side of the road opens up to a river, rolling green hills beyond. The sun is doing all that it can to break through heavy cloud cover, but so far today no rain has made itself available to shuffle residents indoors or force that VW Bus to run its wipers. The man is in his mid-30s and looks weary, perhaps a bit stressed out, from a long day of travel perhaps or other background devices unknown to the average passerby, but his eyes are alight and he’s studying every storefront on East Avenue in Thomas, West Virginia. A Flying Pig promises the best breakfast, all the day long. A coffee shop with rustic signage screams hipster just as loud as a large purple building at the end of the street declares a place to listen to bluegrass and then crash out in the hostel upstairs. Vintage bicycles are locked up outside of a guitar shop smaller than most food carts. The man leaning against his Bus looks a bit perplexed. “Hey man,” the leader of this pack extends his right hand, the customary shake ensues between the two. “What year is your bus?” The three men behind their leader nod or configure their fingers into peace signs. “’78,” the man says, leaning up from the old girl and positioning himself so that he isn’t blocking even an inch of her vintage campervan majesty. 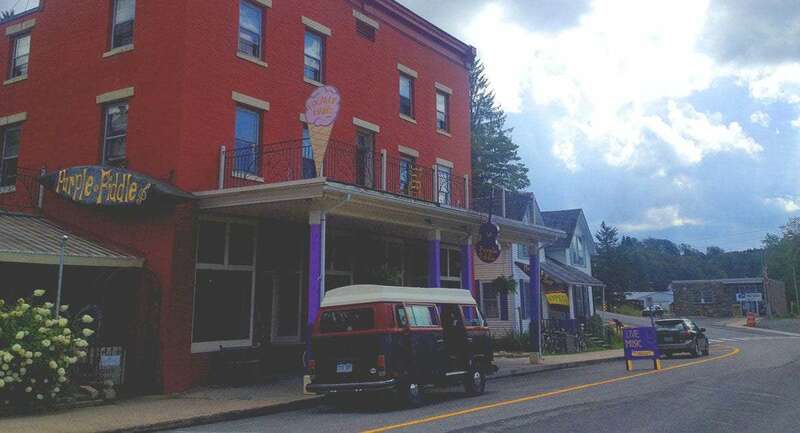 “Alright, I thought so,” says the bearded young leader of the pack, “we’ve got a Vanagon just down the way.” A Vanagon is a 1980s model Volkswagen Bus, and there’s is white and clearly visible as it rests in front of the Purple Fiddle, the large purple bluegrass venue and hostel on the corner of East Ave. Conversations continue about the many bands–from relative unknowns to major acts–that play the fiddle. About how to keep a twenty or thirty year old vehicle running smoothly. About the oddity that is Thomas, West Virginia. Just then the sounds of a crying baby erupt from the Volkswagen Bus and the man’s girlfriend emerges, a toddler on each hip. The man flicks the cherry from his cigarette and tosses the remains into a nearby trash can. More handshakes, more peace signs, and they part ways. The street is not busy, but as it also serves as a short stretch of West Virginia Higway 32, it’s by no means empty. Rednecks in old white pickup trucks with camouflaged duct tape holding the tailgate up and old geysers rumbling their jalopies into town pass by. Truckers on their way to wherever, those who’ve never gone this route before, give it all the same double take our man with the Volkswagen Bus is still doing. A gang of motorcycle enthusiasts who also share a love of embroidered leather jackets make their way through town, and then loop back for a second take. Young families of fit couples and their children slung into baby carriers or over their shoulders pull in and out of parking spaces, running into the bank or just come to town to join the rest at the Purple Fiddle. 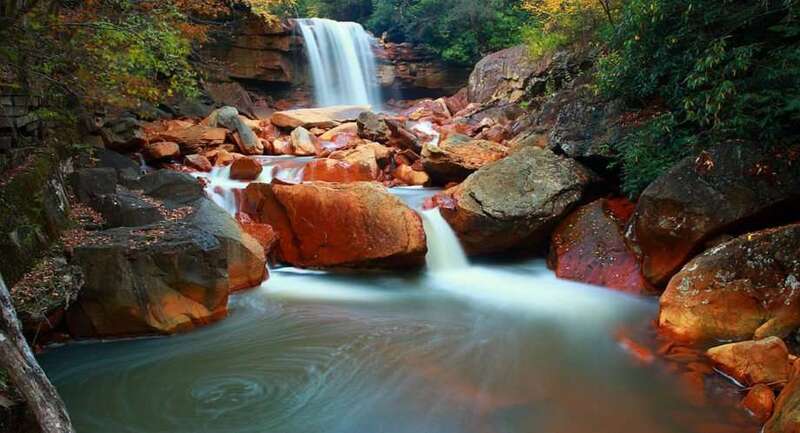 Autumn waterfalls in West Virginia. Photo by Forest Wander. Nothing quite is as it appears to be in Thomas. Where one is told to expect West Virginia to be a bit overly conservative, heavily backwards even, Thomas is hipster progressive. Where most hipster places have sleek, shiny upgrades everywhere, Thomas is rustic and charming like an old oak barrel of whisky found in a newly purchased home’s attic. The man, his girlfriend and their two boys duck into a coffee shop claiming to be Tip Top. Again, things are not as they seem. Indeed, the place serves coffee, but as prominently it also is a bar crafting unusual cocktails. A children’s corner has a small play kitchen and a few toys. A slew of twenty-somethings play the game Risk at a coffee table near the front door. In a booth, a couple sit across from one another, he on a PC playing some first person shooter, she on her Mac checking Facebook. At the bar, three guys of widely varying ages laugh about one of them getting a Jeep stuck and unstuck in some mud. The timing of when this all took place is unclear, but what is highly evident is that the man who looks like a large, bald redneck is rather intelligent, and he’s got the other two younger, more dapperly dressed men, enthralled. Their conversation turns to Obamacare, and he is surprisingly not vehemently against it. In fact, it sounds like he’s quite happy to have health insurance, and the daredevil feats an eavesdropper hears him recant feel a little more enjoyable knowing that if he breaks his arm, the local hospital will fix it up good as new for him. The man and his girlfriend, their children now playing in the corner, smile. They see what’s going on here. It’s a bastion of small town perfection in the Appalachian Mountains. They themselves travelers, such places were not unbeknownst to them. Though rare, there are actually several of these little mountain town oases scattered throughout the Mid-Atlantic. They find themselves invited into the conversation. “Why is it so cool here?” VW Bus asks Jeep. Jeep, and his friends, all laugh. “Move here and you’ll find out,” he replies. Many a small town that has worked hard to build something great for itself is packed with distant residents, those who are wary of others coming in, touristing up the place, and ruining what they’ve worked to build. Here, the locals are inviting VW Bus and his family into their lives openly. VW Bus and his family climb back into their little campervan home on the road and make their way a bit further down the road to Blackwater Falls State Park. A set of some hundreds of stairs descend into a rather lush undergrowth of redcedar and rhododendron, promising to lead hikers to the waterfall that lends its name to the state park. 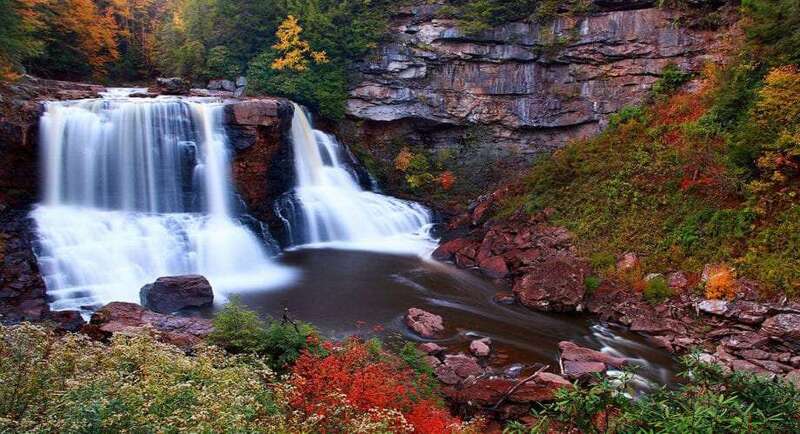 Blackwater Falls. Photo by Forest Wander. The nomenclature seems appropriate. Hemlock needles fall into the water and aid in increasing the acidity, specifically by adding tannins to the water, giving it a very black appearance. Autumn is adding the appropriate Halloween hues to it all, and the all around appearance of a sizable waterfall, significantly higher reaching cliffs all around, and the vibrancy of October in general play out like tricks on the mind. One of the boy’s shoes suddenly comes loose from his foot and falls over the edge of the wooden deck from which they’re all viewing this spectacular sight. VW Bus grows frustrated at first, not particularly keen on his child losing a shoe, but looks over and see it dangling from a maple tree just a few yards below. His eyes jot around the cliffside and forest surrounding until he procures a stick both long enough, and with a hooked notch from a broken off branch that he can use as a makeshift fishing pole. The angle is awkward, but he lowers the stick toward the shoe. Both boys are screaming in happiness and anticipation. He requests silence, but even if the boys were able to contain themselves, the waterfall refuses to cooperate. So he continues, attempting to thread the shoe with the stick like a fat-fingered, far-sighted seamstress might struggle to thread a needle. He thinks he has it, but instead the shoe is knocked from its resting place in the limbs of that maple, already a vibrant red hue this time of year. He snaps his hand back and raises the stick in frustration at the loss, only to notice that the shoe was simply stuck again a few branches closer to plummeting directly into the river below. This time he works it from a different angle, slowly, not wanting to buzz the sides of the tree like a lost game of Operation. He slides the hooked branch into the shoe, angles it slow and pulls the entire thing back up to safety. “You’re like a hero, dad!” one of the boys calls out. They ascend the stairs, return to their Volkswagen Bus, and make their way to another hike, this time Lindy Run Overlook. As they’re pulling out of the parking lot, the Bus stalls, and the man attempts to catch it in gear as it drifts slightly downhill. It catches, he throws it into third and they’re off, but suddenly a couple of pedestrians emerges from the forest and he hits the brake, once again stalling the 36 year old vehicle. They’re now stuck at the bottom of a hill and catching it in gear isn’t an option. Moments later a state policeman pulls up behind them. He takes a few minutes to do anything, presumably checking their plates, and then pulls up alongside. “You need to get this moving,” he says, and pulls away. So much for serving and protecting. “She’s just flooded,” he tells them. “We’d better not,” one says to the other, “if something happens we’ll be in trouble. Is there anything else we can do?” they ask again. “You can move your truck out of my way then, I guess,” he says, still pushing the van, coming closer to their truck with every oomph. They hop back in and are gone. So much for the park service. Finally, about halfway up the hill, a young couple pulls up in a small white car. “Need some help?” he yells from the car window. “I could use a little help pushing this thing!” the man cries back. And within minutes, the two are pushing the Bus up the hill, and then back down. The man hops into the Bus, throws it into second gear, turns the key and hits the gas. With a small sputter, they’re off, the Bus running wonderfully once again and everyone inside yelling, “Thank you!” back to the good samaritan. It’s the real people of West Virginia that shine as brightly as the leaves, their ability to lend a hand to a stranger as deep as their gorges, as wide as the space between the endless mountaintops. The sun begins to set in the rearview mirror of that Volkswagen Bus and so the family retires back to their campsite for the night. Lindy Run Overlook will be waiting for them in the moment, and they’re sure by now that they won’t regret it. 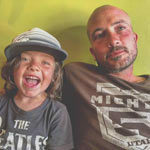 Tidbits of our month long stay in Terlingua, Texas, living and working for the Las Ruinas Camping Hostel. Short story about a desperation for living, a woman fabled, and marijuana.